The Roman Anglican: Florentine links - Church of Ognissanti. All roads lead to… Florence. The present church was completed during the 1250s but was almost completely rebuilt in 1627 making it one of the most known Baroque churches of Florence - though maintaining its original Medieval setting - especially in the transept. Yet, this was one of the first attempts of Baroque trying to penetrate in this Renaissance city. Above the entrance a wonderful glazed terracotta lunette by the school of Della Robbia was saved from the previous church. To the left of the church a lovely late Medieval campanile still stands. The Umiliati soon gained a reputation in Florence and in fact several works began to accumulate in this church - including Giotto’s masterpiece Madonna and Child with Angels (1310) for the high altar. 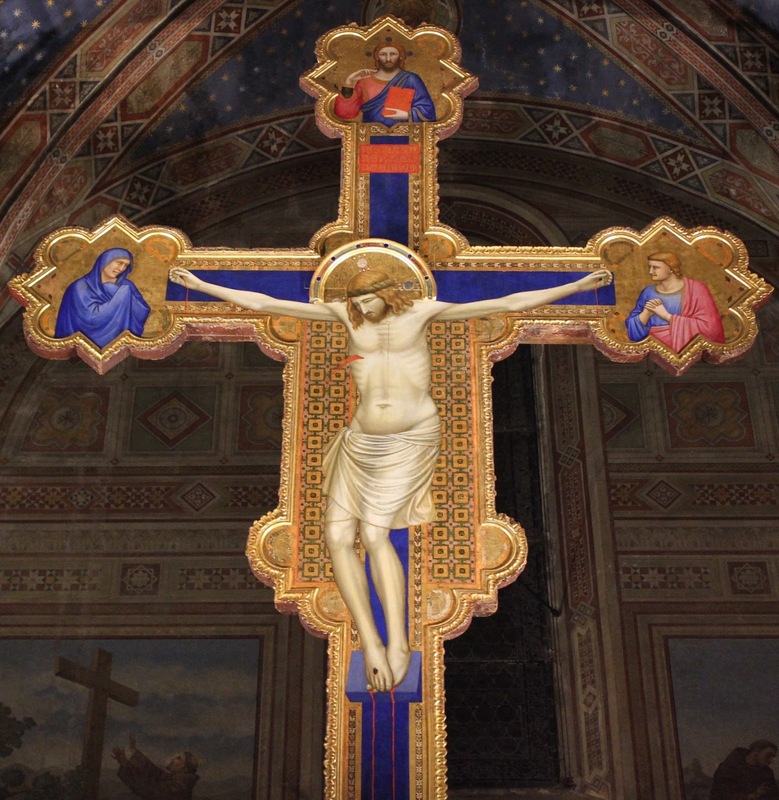 Also, the recently attributed to Giotto’s crucifix in the left transept can be considered one of the signs of the importance of this foundation even during the late Middle Ages. During the late Renaissance, especially in the XVI century, the Umiliati lost power and in 1571 the Church was given to the Franciscan order - several relics were brought to the church - including St. Francis’ robe. This church literally flourished in the Renaissance when several works were commissioned by one of Florence’s most prominent Families… the Vespucci who commissioned important works to the greatest artists of the time - including Ghirlandaio and Botticelli who is buried in the church, near his beloved Simonetta Vespucci. The Vespucci Chapel is on the right hand wall, near the entrance. The Vespucci were one of the greatest families of Florence and especially of the Ognissanti neighbourhood - they were allies with the Medici and were known for the great explorer Amerigo (after whom a certain land across the ocean was named). The family chapel was completed between 1471 and 1472 in Ognissanti and decorated by the young Domenico Ghirlandaio who was 23 years old at the time and new in the Compagnia di San Luca (the confraternity of artists) - this is in fact one of Ghirlandaio’s first works. The chapel was originally elsewhere in the church and was moved to its present location in 1627. In 1878 the frescoes were discovered under a whitewashed wall… it was when part of the frescoes was damaged, thankfully most of the masterpiece still survives today. The decoration shows a central scene representing the Deposition or the Pietà which is also an altarpiece - the background is probably an ideal Florence. The body of Christ is pale and scarred and in an unnatural position - his legs are held by Mary Magdalene. Behind him a weeping Virgin stands near St. John who is holding his arm. Around the scene other saints are represented, including St. Joseph and St. Nicodemus. In the background the Golgotha shows the cross of the martyrdom. Above this scene there is a representation of the Madonna of Mercy - her large cloak is wide open and held by two angels. A group of figures is kneeling under the cloak - here Ghirlandaio for the first time tests his extraordinary portrait technique. The Virgin is portrayed as facing the public with her arms wide open. The study of the light is also extremely accurate - the feet of Mary leave the shade while protruding on a step on which an inscription reads “MISERICORDIA DOMINI PLENA EST TERRA” (The Earth is full of the mercy of the Lord). The cloak’s creases are heavy and deep - they remind of Verrocchio’s work. The back of the cloak’s hem can also be seen as the result of a refined work on the perspective. The kneeling characters belong to the Vespucci family - women on the right and men to the left - among them a young Amerigo (according to Vasari) the first young man on the left of the Virgin. The theory is proved since another image of Amerigo can be seen in a 1507 globe made for the Lorena where an elder Amerigo is portrayed. In the foreground there is also an elderly man dressed in red - he is probably the head of the family, with his wife - the woman in the black dress. There is then a noblewoman in a rose mantle according to the Renaissance fashion - she is known as Ghirlandaio’s wife: Costanza di Bartolomeo Nucci - though they might have been only lovers then since they married in 1493, but she did not belong to the Vespucci family hence there was already something going on! The bishop who faces the Virgin is the then Archbishop of Florence who was Giovanni de’Diotesalvi, wearing a beautiful cope in golden damask. The monk with the white cap is Simone Vespucci, the benefactor who founded the Hospital of San Giovanni di Dio in his estate. The character looking at the spectator invites us to enjoy the party and and elderly merchant closes the scene with his extravagant red hat. This is a fresco by Botticelli which can be found on the right hand wall - in front of St. Jerome in His Study by Ghirlandaio, both were executed in 1480. Botticelli also made another version of this subject which is now in the Uffizi Gallery. Together with Ghirlandaio’s St. Jerome this work was commissioned by the Vespucci as shown in the coat of arms above the fresco. Both works were located elsewhere in the Church but where moved to their current position in 1627. There is great care in the details - like the jewels that decorate the miter or the reflection inside each pearl and precious stone that is a clear influence of the realism of the Flemish Renaissance which arrives in those years in the rich Florence from the north… the greatest example is the Portinari Triptych by Hugo van der Goes. This is probably a joke made by Botticelli who often noticed the friar setting off for an escapade. This is a very witty image of an artist who is often referred to as melancholic. The plasticity, the energy and the expressiveness of St. Augustine derive from the example of Andrea del Castagno (especially his Cenacolo in Sant’Apollonia) - the representation of the anatomy is first-rate especially in the hands which look almost statuesque. There is a certain sense of restlessness in the fresco, it is particularly evident if confronted with Ghirlandaio’s St. Jerome on the opposite wall. This tensions are possibly provoked by the recent dramatic Pazzi Conspiracy (when another prominent family of Florence tried to kill Lorenzo de Medici and his brother Giuliano - who was killed - to put an end to their dominion over Florence). There was a crisis made of doubts ending with the death of Savonarola - the terrible "puritanical" monk. Botticelli was one of the artists who had been most influenced by this crisis - his style returned to somehow more archaic forms and often the themes became religious. This is a fresco by Ghirlandaio which also dates back to 1480 and is found on the left hand wall. This work was commissioned by the Vespucci together with St. Augustine by Botticelli. The two frescoes have a similar setting - they describe two doctors of the Church in their studios, full of books and all sorts of intellectual objects. The two frescoes used to be in the area near the choir doors which was destroyed in 1627 - when the church underwent a Baroque phase. This work has a different approach to the theme - when Botticelli (3 years younger than Ghirlandaio) uses a great expressivity and plastic energy that derive from the work of Andrea del Castagno - Ghirlandaio creates a more serene and conventional figure with plenty of little objects and still life in the background. Also Domenico was inspired by the northern Renaissance - probably by another St. Jerome in His Studio, the one by Jan van Eyck and owned by Lorenzo il Magnifico. 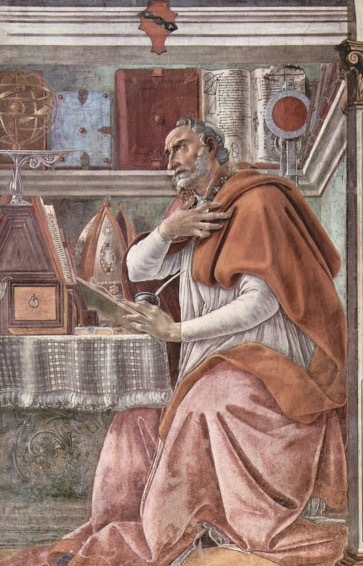 While St. Augustine conveys ardor, celebrated by the pose of his hand and his face looking at the source of the celestial light - Ghirlandaio creates a more serene and relaxed scene - St. Jerome is resting his head on his arm which is also resting on its elbow, he then looks outward, to the public while he is writing with the other hand. This is also a pose used by Jan van Eyck. The open books and papers are in Greek and Hebrew and they remind of his activity as translator of the Bible (with the Vulgata). The date on the desk is MCCCCLXXX - there are several objects on it, laid in well-ordered way: a sealed letter, a pair of spectacles, two inkwells (red and black - some drops poured down from them), scissors, a row, a candle holder with a short and unlit candle. The desk is covered by a rare oriental rug - an object often used by the artist and surely inspired by the Flemish. There are other objects on the selves: a cardinal’s hat, two apothecary jars, a cylindrical box, a necklace, an hanging purse, some fruit, two bottles of clear glass and an hourglass. The Cenacolo is a big fresco by Ghirlandaio in the refectory of the church representing the Last Supper - the refectory is located between the two cloisters of Ognissanti. This work is also by Ghirlandaio and dates back to 1480. The work was commissioned to the artist when he was already well known - he was preparing to go to Rome to decorate the Sistine Chapel along with Botticelli and other prominent Florentine artists. In that same year he works on St. Jerome. During restoration works the sinopia of the fresco was found and now hangs near the Cenacolo, in the original project there are some differences - in the definite version Ghirlandaio adds more expressivity to the apostles. The artist also made other two Cenacoli in Florence: the one in the Badia di Passignano (1476) and the one in San Marco (1486). The work was much celebrated at the time. The fresco is located in a wall with two lunettes and a big squared portion. Here Ghirlandaio abandons the usual perspective system and invents a sort of loggia which reflects the very architecture of the room in which it’s found. This effect is also contributed by the study on the light which coincides with the actual lightning of the room - the two arches in the background reflect the two actual windows of the room. The effect for the friars would have been that the presence of the Lord would have been so real that it would have been as if the Lord would have been eating the Holy Supper with them. The colors are rather delicate. The table is “U” shaped and the apostles are divided in couples - they react in various way to the announcement of Christ - one of them all betray him. Peter elevates the knife as if to protect the master. James looks disturbed and other argue more or less peacefully about it. A young apostle, dressed in green (Saint Thomas) leans his arm on the table as if he is going to argue with Judah - he sends him a piercing look. The two apostles on the extreme right point their breasts - they wonder whether Jesus was referring to them. The dramatic aspects of the work are quite limited - in fact the representation is rather serene. Judah is slightly separate from the other apostles - according to tradition - he sits on the opposite side of the table. John rests on the right shoulder of Jesus. The overall situation is rather calm. As in the Cenacolo of Badia di Passignano, Ghirlandaio reconstructs the perspective of the table in a way that exalts the dishes - he was inspired by the realism of the Flemish artist in this case as well. The same care in the details can be found in the table cloth and its embroideries and then the flowers, etc, etc. This is probably what the average Renaissance table would have looked at the time. From the arches of this ideal loggia it is possible to see some trees in a garden with several birds flying in the clear sky. The birds symbolise nature and its continual renewal, there is also a peacock, symbol of immortality and a hawk, a duck, some robins… Among the bushes there are several kinds of fruit - some of them are also on the table. The carafes are full of water and white wine - the food includes bread, cheese and ham of various kinds. Peter has an empty glass but he seems to have just cut some cheese. Leonardo himself came to see this work and was inspired for his similar work in Milan.